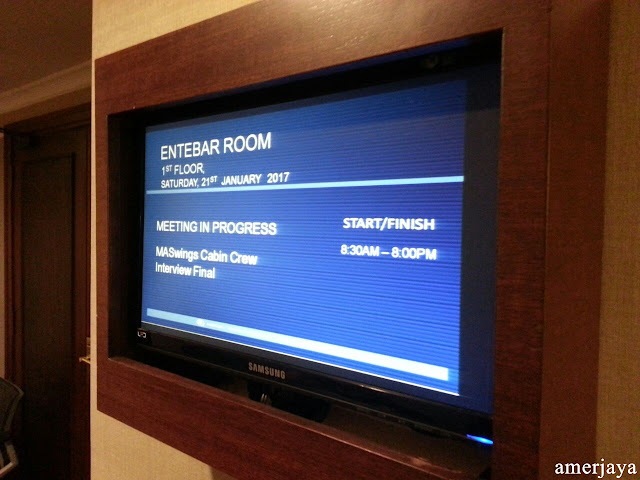 Last year 2017, I went to the Maswings Cabin Crew Interview at Hilton Hotel. I'd like to say that, only shortlisted candidates will be called and I am the one on the list. 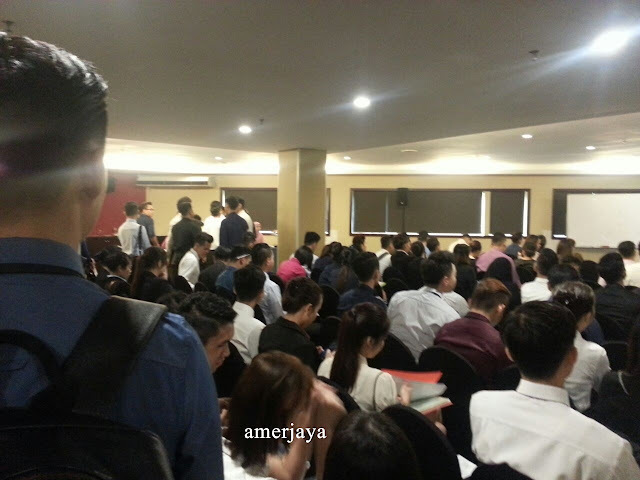 So I thought the candidates are not as many as candidates who goes to the Airasia Cabin Crew Interview. So, I planned to show up a bit late to the interview venue as I am so confident thinking that only few numbers of candidates will show up. So, as I arrived quite late, the interview registration has been opened since 8.30am, and I managed to arrive at 10am like that. Can you imagine how relax I am on that morning? I parked my car at The Hill's basement car park. Can you imagine how much time do I have to spend to walk from The Hill to the Hilton? I just remain calm and go to the nearest 7 Evelen to buy a reload coupon. I can't live without internet, because that day, my internet plan happens to be expired. So, I still can walk so calmly to the hotel. And still managed to take pictures of the hotel for the blog purpose. 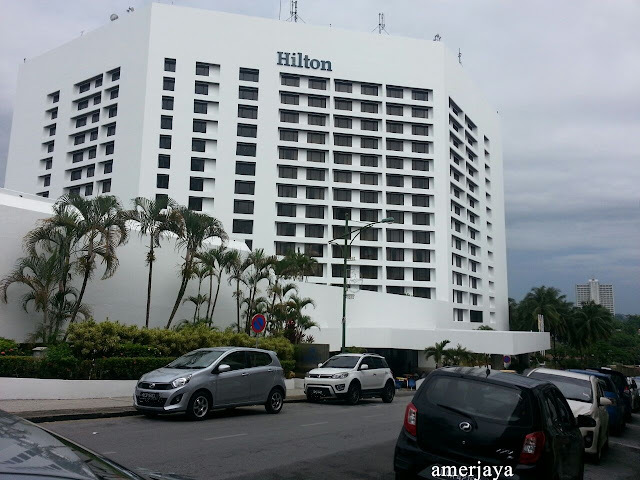 Once I entered the Hilton hotel, I started to feel nervous. It's like everyone there are watching me. So, I walked calmly to the service counter and asked them where's the exact location for Maswings' interview. So, he shows me the direction. 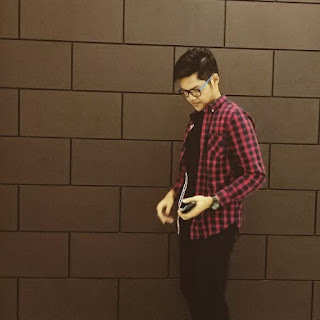 As I arrived to the venue, I am super duper blur. There are so many people who already have their queue number, but still, there's a lot of applicants still queuing for the queue number. So, I started queuing from the back. I thought I was the only one who happen to be late. But, there's about 4 people who arrived late too. I feel relieved. I have members who are not punctual. LOL. So, there is one Chinese guy in front of me looks quite tall. I'm so sensitive when someone is taller than me. They'll drop my confidence. So I asked him how tall he is, he said he's just 174cm something like that. Nahh I feel so relieved after that and gained my confidence back. Started from that, we start chit chatting on random stuff and one thing that pick my attention about him is he's Uber driver. Wow, I should learn about Uber from him someday. For the entire of the day, other candidates think that he's my friend because we speak like we have known each other for some years. Actually, it is just proving that you are excellent with people and ready to be a good cabin crew. So, if you want to get rid of your nervous, I suggest you to speak to anyone that you meet on the interview day. That's going to be my first tips. So what should you bring to the interview? All you need to bring is your SPM certificate, IC/Mykad, passport size & full length photo for the interview, and your comprehensive resume. I think my resume looks quite nice and good for cabin crew recruitment purpose. Don't forget to bring along the copies of the certificate. You'll be eliminated on the first stage if you failed to bring all the things that I mention above. Don't forget to bring along some biscuits and mineral water with you. Whatever water it is, as long as it is in the bottle to ease you to keep it in your bag. Don't forget to bring along something that can warm you up such as blanket blazer or sweater. It's bloody cold there. So here you are. The interview session has 4 stages that you need to go through, to go to the final interview(stage 4). Maybe I will share only a few tips with you and what you need to prepare for every interview stage. Stage 1. For stage one is for documentation process. Do come super early if you want to go back early around 1 to 2 pm. Otherwise, you'll end up to be like like me, come late, and be in the last group to be interviewed on that day. At this stage, they will check your height, weight and of course your BMI. There's a lot of candidates who failed at this stage. Due to their height and their weight. If you're overweight, it is advisable not to come to the interview. You're just wasting your time. For height measurement, do take a deep breath so that it will make your body to be taller than usual. Stage 2. Stage 2 is the stage where the staff will check for your grooming. Get yourself ready to look well presentable or else they will reject you. My tips is just be yourself and always smile. Don't get nervous at this stage. They don't test or check your communication yet. They just wanted to have a little conversation with you to soothe down your nervous. But, I am freaking nervous at this time and I don't know why. They ask me to roll both of my shirt sleeves to look whether I have a scar or not around my hand and my sleeve. And then they asked me to loose my necktie to look around my neck whether I've scars on that area or not. Meanwhile, another staff were like zooming into my face, to see if I successfully hide any scars on my face using any product or not. So beware guys. After they are done checking, they asked me to pull the luggage next to me, and walk along the room. It's quite odd to pull the luggage while someone is watching us, but I do it without looking awkward. Then, they asked me to wait outside for the stage 2's result. Chin, the Uber driver, he looks so agitated about something after he came out from stage 2's room. And then one of the staffs comes out from the stage 2 room, and says that I, Chin and another 2 candidates pass the stage 2 and asked us to wait for the 3rd stage. I'm kinda nervous because I'll be interviewed in a group and not one by one. After seeing my group members, Chin, Sarah and Ex Airasia Cabin Crew, they spoke English very well. I really lose my confidence to speak. So guys do prepare for the best. I never wish to be in the same group with them. HAHAHAHA. While waiting for the stage 3, Sarah notices that one of the candidates was busy memorizing his script. Sarah told me, it is really dangerous if you are memorizing a script. Do it spontaneously. Eleh, easy for you bah you spoke better English (me talking to myself). So, I just not my head and said oooo ooo ya lo it's very dangerous. We can't expect what panels are going to ask us. Stage 3. On the stage 3. You'll be interviewed in a group. So in my group, I have 4 members including me. So here is the time where I lose my balance after knowing the fact that Sarah, Chin and Ex AA cabin crew will be in my group. They'll definitely dimmed my superpower. Haha Just jokes. I still need to gain my confidence no matter what, and I just considered them as my team member and we work as a team. I don't compete with them. I just perform as best as I can. After listening to the way their answers the question from the panels, they look so calm. How come they can be that calm? I'm shivering like hell because the room was bloody cold at that time. So, since our group is the last group to be interviewed, they asked us to do something where the previous group were not. What's that? I expected that they will ask us to perform or do a role play. But thanks god, my expectation is wrong. They only asked us to do a catwalk and to see the way we walk. So all of us walk with confidence with a smile always on our face. After doing walking, they started to ask us to introduce our self. And then they asked common questions such as why do you want to be a cabin crew, what do you know about Maswings, why you choose to be cabin crew even though you've a bachelor's degree etc. You need to be well-prepared and don't expect them to ask you the same question. It's your luck if they ask you the same question. The question might be changing over time and maybe getting hard. So do your revision about the airline. Know who's the CEO, what airplane that their airline use, etc. And the last question for this stage is, do you have any questions for us? I didn't prepare any questions to ask so I kept my mouth shut. 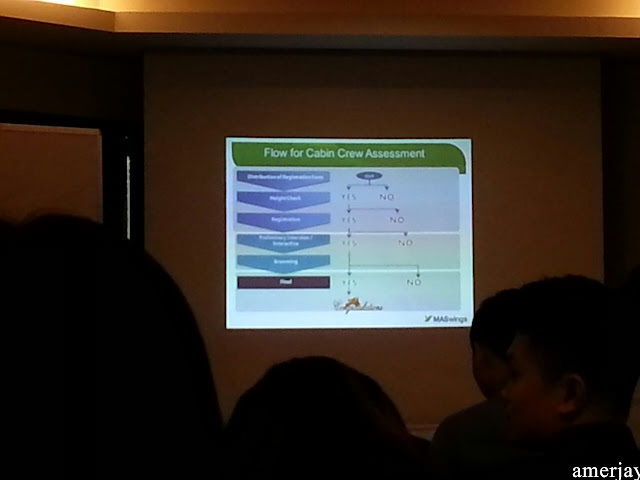 Sarah asks about how many vacancies for Maswings' cabin crew, Chin ask do they provide any transport and accommodation to the cabin crew who goes to the training. The panel seems like waiting for me to ask them something, till they call my name. Amir, would you like to ask something? It's freezing to death inside that interview's room and I can barely think any questions to ask them. So, I just shook my head and said no with a smile. For those who are going for the upcoming Maswings' cabin crew interview, do please think any questions to ask them to make you look like you are eager for that position. After that, the panels (2 panels) ask us to wait outside and wait for the result. Here again, I have lost my confidence, I thought that I'll be eliminated at this stage. I just can feel it's coming to the end. I know all of my group members performs well, but not me. And then, there's another girl waiting for the final stage that's stage 4. So I approached her, and asked her where's your group member that's another three. She said to me that 3 of them failed the stage 3. She's the only one who passed the interview. At that time, I felt like to faint. I recalled that one of her group members is the one who memorizing script before entering the stage 3 interview room. Susan was right, avoid memorizing script, just do it spontaneously to avoid blank or blur. Not long after that, one of the staffs comes out from the interview's room and said that "congrats, five of you passed the 3rd stage'. And I still freaking nervous and I've no idea what it is all about. Is my name included in the list? I still lose in the ocean. Am I eliminated? Chin just happily says something to me, but I can barely hear what he's talking about. I just follow them calmly to the next interview's room. I was thinking that my group has passed the third stage and have done our best so we don't need to go to the final stage. Silly me. The final interview takes place at somewhere far from the documentation room. I think it's at somewhere like rooftop like that, because the view up there is superb nice. Stage 4. As for the final round, there's another one applicant join our group since she's the only one in her group who passed the stage 3. So she joined our group. She has a bachelor's degree same as me. And I feel really like sending myself to the tiger cage. Lmao. All of them are well groomed and spoke English well. 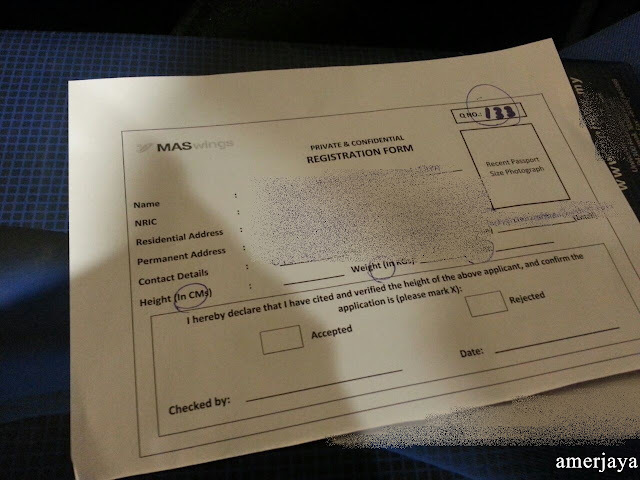 So at this stage, they would ask for your original certificates such as SPM, Degree's or Diploma certificate. There are going to be 4 interviewers that will interview us. Four of them are the great people from the Maswings company. So, you better be well-prepared for this stage. Enhance your English. Structure your words. Know how to answer the question. Just be yourself. It's ok if you have broken grammar, but you need to be confident to speak. They would love to see your effort. Answer all of their questions. There is no right and wrong. They wanted to see how we manage or our effort to answer the question. If they ask you, do you have anything to ask? Do ask them anything. If you think your question is quite nonsense. Just ask them that question instead of seating like a log. And the killer question is, tell us why should we choose or pick you? So, prepare your answer to answer this kind of question. I think I am nagging too long. I want to share my story with my reader. I want to let people feel my situation. How unfortunate I am on that day be in a group with well-prepared candidates. Do bring a chocolate bar like snickers, that can warmed up your body. Do smell good, bring along perfume with you. You'd never know if your body will smell bad. The interview process can take you from 9am till 7pm. Get ready and break a leg. Dear readers, If you've anything to ask regarding about the interview, don't hesitate to ask me through the comment section below. Kalau ada soalan tanya je jangan malu-malu dekat ruangan comment tu. Saya jawab je soalan anda semua. If your dream is to become a cabin crew, just go for it. We can travel for free and do thing that we like. Do please master your grooming before attending to any cabin crew interview.